There are few hikes in the American West, or anywhere else, which allow you to observe two beautiful waterfalls, three alpine lakes, glaciers, colorful fall foliage, and the snowy 13,000 foot (3962 m) peaks of the Continental Divide. Especially a moderate, ten mile round trip hike from a convenient trailhead. However, it's not all easy. You do get a rather exciting climb up a rocky waterfall chute to reach the final destination. And the weather is extremely changeable here. 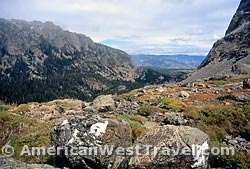 Our hike arises in the Bear Lake region of Rocky Mountain National Park, one of the park's most beautiful yet accessible areas. For good reason, the most popular and congested area in the park. However, the crowds diminish quickly as uphill progress becomes more strenuous. You then get to enjoy a great mountain wilderness with limited distractions and unlimited beauty. 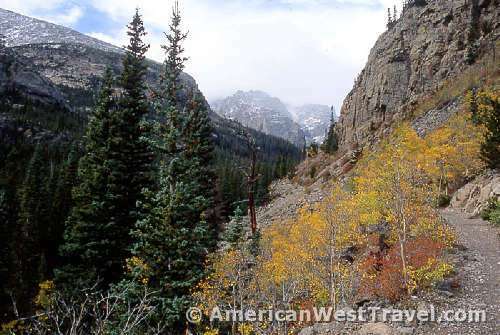 (Photo Above, left): A sample of mid-September fall colors near the start of the trail. 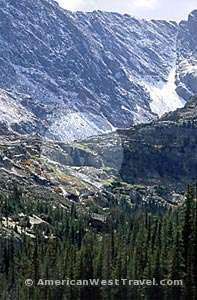 The wide, manicured trail with its heavy foot traffic reaches to beautiful Alberta Falls, (photo, right), about a mile from the trailhead. After the falls, the crowds thin out quickly. They say that there are only two seasons in Colorado: summer and winter. On our arrival at the park's Morraine Campground, we had been experiencing gorgeous late summer weather, lots of sun and temperatures in the 80s°F (26°C). The next day when we were ready to hike the weather had changed to temperatures in the 40s°F (4°C), gusting winds, plus rain and snow squalls. We did not bring winter gear but we didn't drive a thousand miles to not hike. Dressing in layers did the trick, four layers of flannel shirts, sweatshirts, and sweaters. Key to this was our gore-tex style rain gear which now proved its worth. 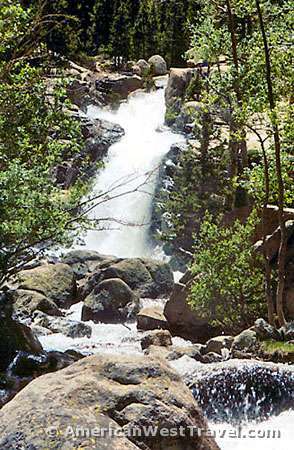 (Photo, Above): The going gets rougher beyond Alberta Falls. 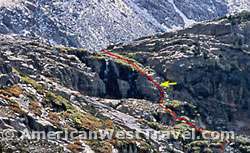 The narrow trail continues across the slide area above a steep canyon. Note the final few colorful aspens which grow here around the 9,000-9,500 foot (2743-2896 m) elevation. Beyond this point there are only evergreens. 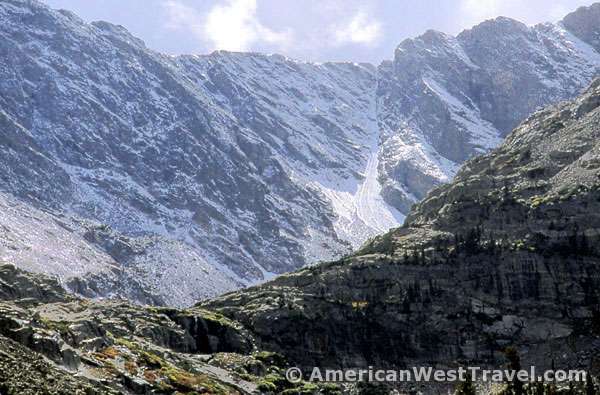 The Continental Divide appears in the background, shrouded with snow squalls. To this point, there have been intermittent showers of rain and sleet but we have remained warm and dry. After a push up some hillside switchbacks, we arrive at the Loch, (photo, right). 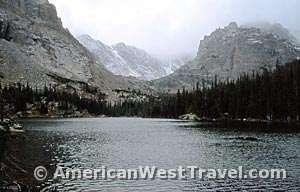 One of the park's most scenic lakes, it is only 3.1 miles from the nearest trailhead, and at an elevation of 10,200 feet (3109 m). The temperatures is perhaps around 40°F (4°C), with light snow flurries. The Continental Divide towers in the distance. Taylor Glacier is just barely visible in the lower right of the notch. Powell Peak (13,208 ft, 4026 m) is above and left of the glacier. McHenry's Peak (13,327 ft, 4062 m) is further left. The Loch is a beautiful place to enjoy a picnic or do some fishing during better weather. 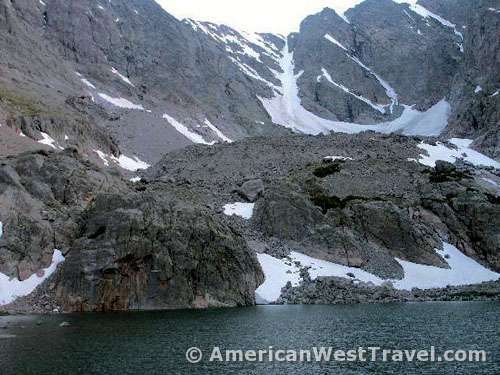 There are nice flat rocks at water's edge offering unobstructed views, a place to eat, and easy places to fish. 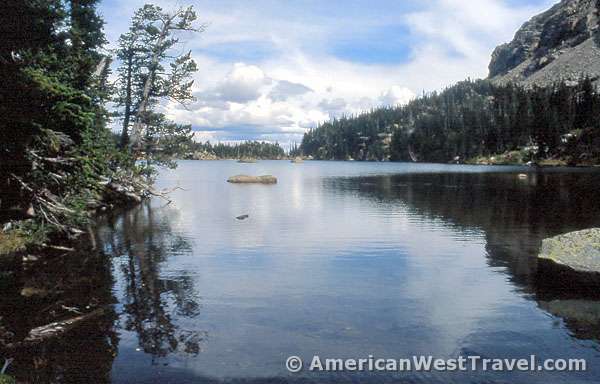 During a sunnier and warmer previous visit we had noted many native cutthroat trout in the lake. Fishing is catch and release here. 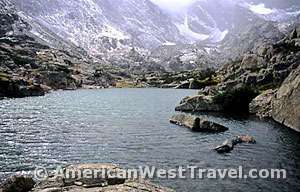 (Photo, left): A fine view from the west end of the lake. (Photo, right): A beautiful view of the Loch facing east. The shot was taken on the way back when the weather had lifted somewhat. From the Loch onward, the trail becomes rougher and less used. Lots of rocks and downed wood. 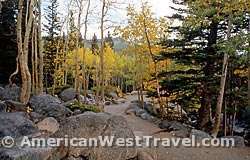 The trail follows the aptly named Icy Creek through heavy woods in a steep canyon. It is deep in shade and very damp, making the going pretty uncomfortable. 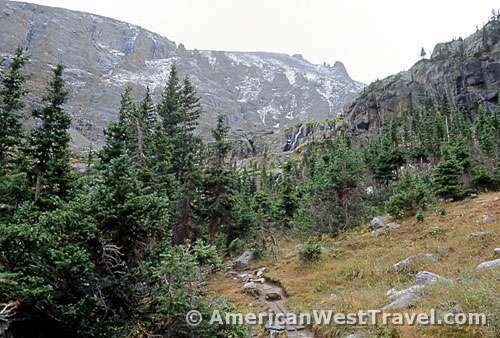 (Photo, Below left): We are nearing the end of the woods and approaching timberline. Note the wooden planks crossing a marshy area. 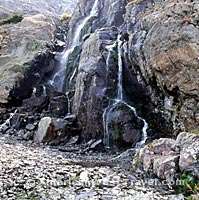 Also, Timberline Falls which is also aptly named is visible a short distance ahead (see enlargement). 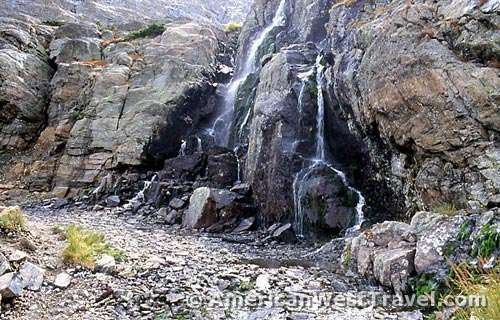 (Photo, Above right): A view from the base of Timberline Falls shows our route. The Loch is visible in the distance, actually only about two miles away. Part of the trail can be seen in the lower left at the edge of the woods. The Photo, left, provides an excellent view of the locale. 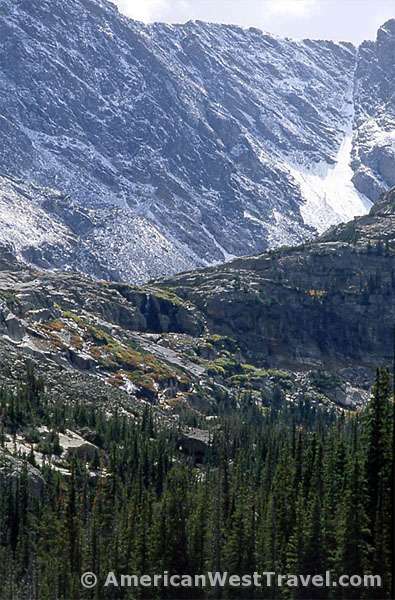 Taken from a distance with a telephoto lens, you can see the edge of the woods where timberline ends, Timberline Falls in the spotlight, and the Continental Divide above, with Taylor Glacier easily visible at right. Click on the image for a spectacular view without the spotlight. (Photo, right): A closeup of eighty foot Timberline Falls, elevation 10,800 feet (3292 m). 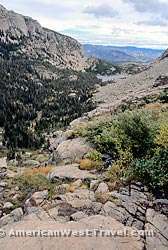 The chute is simply a boulderfall from the top of the ledge to the bottom. It has a small seepage which must run heavily during the spring melt, making the route inaccessible. You must scramble up this very steep rockfall to gain the top, boosting yourself up in a couple of places. The steepness and wetness make it a nice challenge. However the high winds and freezing weather also made it rather scary as well. Click on the photo, right, for an enlargement without the line. Upon reaching the top of the ledge, the environment immediately changes to arctic tundra. The stark Lake of Glass lies in front of you (Photo, left). The most noticable effect is the harsher weather. The temperature immediately dropped about ten degrees, close to freezing (32°F, 0°C), and the wind is howling without letup. I estimated the wind chill temperature as zero°F (-18°C). Our layers of light clothes are no match at all for these conditions. It is clear that it's unsafe to stay here, and that we must retreat down the ledge immediately. The larger Sky Pond is just beyond the ridge at the west end of this lake but it's all rock hopping from this point onward, making for slow going. So, it's time to leave. (Photo right): A photo of Sky Pond, reprinted by permission from the site, Rocky Mountain National Park - the High Peaks. Mr. Gordon Novak has many other fine images from this area. 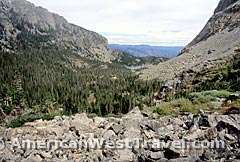 Photos, left and right, are excellent vistas looking back towards the Loch from above Timberline Falls. 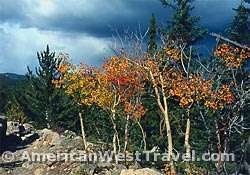 Note, left, that the lichens and shrubs also turn color in the fall, becoming a bright orange. As we quickly descend, the bad weather lifts a little, and the day becomes warmer. We finally feel comfortable enough to stop for some lunch which consists of gorp, cookies, and crackers. As we again approach the Loch, Gerry stops in a clearing to take some photos of Timberline Falls and the mountains with a telephoto lens. This effect spectacularly demonstrates the huge vertical rise of the Continental Divide, which couldn't be captured up close. It provides an excellent view of Taylor Glacier and, to its right, Taylor Peak (13,153 ft, 4009 m) which was previously obscured (Photo, right). Once past the Loch, we continue down the mountain without further lingering as another squall approaches. 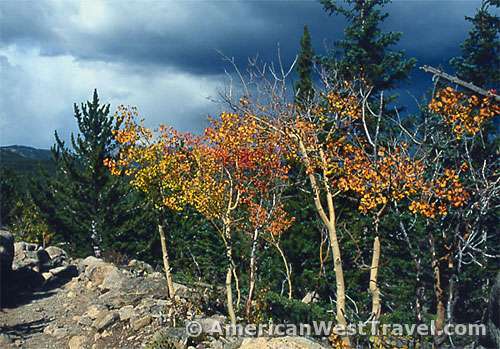 (Photo, left): Some colorful aspens with dark clouds hovering overhead. We make it back to our vehicle without further rain. Our modest, ten mile hike has provided more than its share of beauty and adventure.